IN A LARGE POT PUT CARROTS, CELERY, ONIONS, PARSLEY, SALT, BLACK PEPPER CORNS. OPTIONAL: GARLIC, TOMATO PASTE, CLOVES. ADD MEAT AND WATER. PLACE ON MEDIUM HEAT AND BRING TO BOIL. BOIL TWO HOURS IF YOU HAVE RED MEAT, ONE HOUR IF ONLY WHITE. 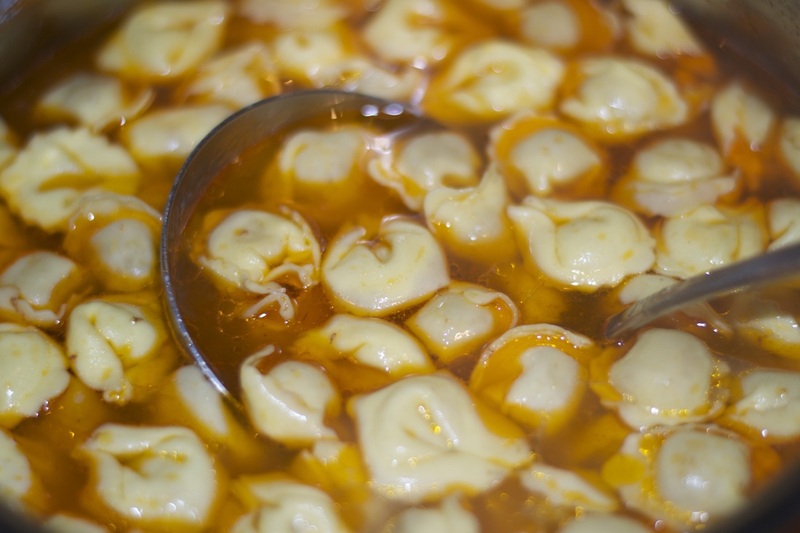 ONCE THE BROTH IS READY, PUT SOME BROTH IN A SEPARATE POT, BRING TO A BOIL AND ADD THE TORTELLINI, COOK AS LONG AS DIRECTED. SERVE HOT WITH A LOT OF GRATED PARMIGIANO REGGIANO CHEESE. FOR A LIGHTER BROTH, PREPARE IT THE DAY BEFORE AND SKIM THE FAT THAT WILL HARDEN ON THE TOP OF THE BROTH.